Dinosaur Kingdom slot is a new game from Edict (Merkur Gaming) and as you might have guessed, it’s all about dinosaurs. We’ve seen this theme quite a few times in the past, so to stand out I think it’s important to have some pretty good graphics and a nice design. Unfortunately, I can’t really say I’m too impressed with how this game looks, the graphics are mediocre and the design is very basic. However, I do appreciate that smaller software developers can’t often produce the best visuals in the industry for obvious reasons, so I don’t want to be too harsh here. What matters is the performance. Tyrannosaurus Wild. This particular Wild symbol is a 2×2 Giant symbol and can appear in any corner of the reels but not in the middle. It will substitute for all other symbols in a winning combination apart from the Scatter symbol. Pteranodon Wild. This wild symbol is shown by the flying dinosaur and appears only on reel 3. When it does appear, it will fill all symbol on the reels to give you a better chance of a win. It will substitute for all other symbols in a winning combination apart from the Scatter symbol. Dino Shield Wild. This Wild symbol also covers numerous positions, being able to land on any position on the reels and then expanding to the adjacent positions both horizontally and vertically to cover a total of 5 positions. It will substitute for all other symbols in a winning combination apart from the Scatter symbol. 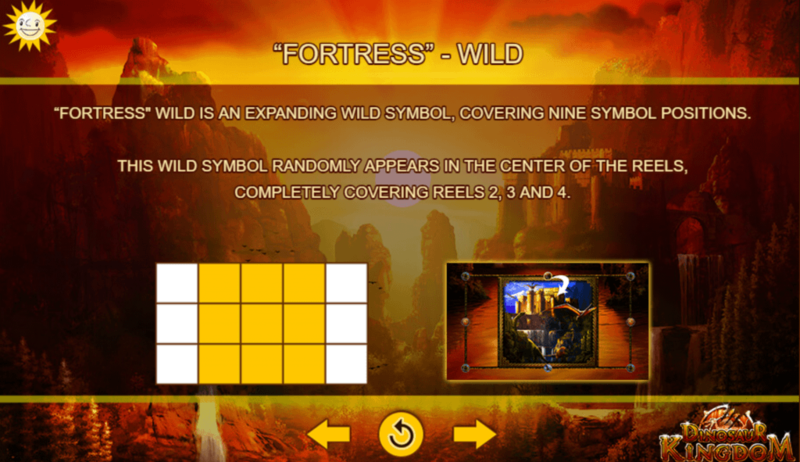 Fortress Wild. This particular Wild symbol can cover the most positions at 9. It will appear randomly to fill reels 2, 3 and 4. It will substitute for all other symbols in a winning combination apart from the Scatter symbol. Free Games Bonus. The Scatter symbol can appear on reels 1, 3 and 5 only and 3 of these appearing at any one time will trigger the Free Games Bonus. You will be awarded with 10 free games to start with to be used on pay window 1. If you manage to land an additional 3 Scatter symbols before the 10 free spins are up, you’ll be given another 10 free spins to play with and unlock pay window 2. All remaining free games will be paid both pay windows. Additional free games can only be unlocked on pay window 1, but you can only continue to unlock pay windows up to pay window 3 as the maximum number of times free spins can be retriggered is twice. Gamble Feature. 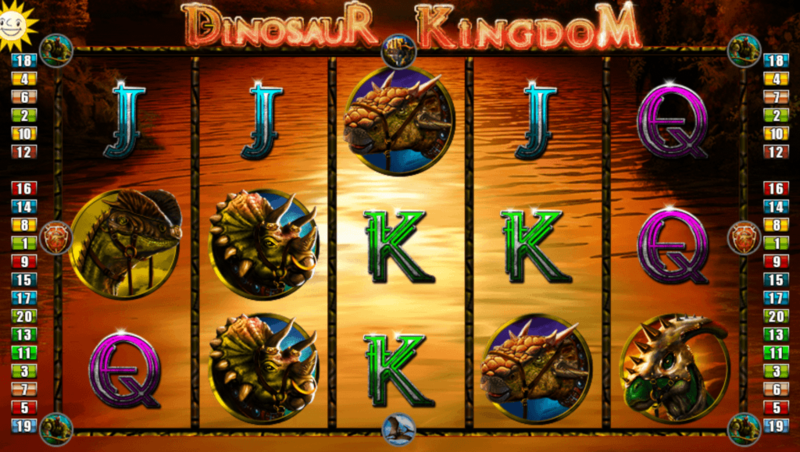 Like many slots, Dinosaur Kingdom slot does allow you to gamble your winnings if you so choose by selecting the gamble button. You will have to match the colour of cards to double your winnings, or risk losing them all. Dinosaur Kingdom slot didn’t really impress me with its visuals, but I did find the features of interest which is why I decided to take a look. There are a good variation of Wild symbols here, some being more valuable than others, and I think it’s nice to get a bit of variation here. The Free Spins Bonus is a little disappointing. I think Edict could have done more here to improve payouts such as offer a better multiplier or additional Wilds, for example. I just think the game as a whole has a few nice ideas but in reality, they don’t really translate to a fun or especially rewarding game. If you want to check it out, head over to Casumo now to use our special offer.